Recently, ZrN has been attracting interest for its excellent corrosion resistance, biocompatibility, high hardness, good lubricity and ductility. Although tribological study of ZrN coating has been carried out extensively, investigation related to corrosion of ZrN film is limited. In view of this and in view of possible applications of ZrN film in several engineering components, the present investigation has been undertaken to evaluate the corrosion response of ZrN film in seawater solution, Hank's solution, 0.5M H2SO4solution and 0.5M HCl solutions. Towards that purpose, potentiostatic, open circuit potential and potentiodynamic study of ZrN film deposited on plain carbon steel has been carried out in all these solutions. Results indicate that stable protective film is formed on the surface of ZrN coating in all these solution except 0.5M H2SO4 solution. The formation of protective film on ZrN coating is fastest in sea water solution and it is slowest in the Cl¯ ions containing media, 0.5 M HCl. The corrosion current is highest for 0.5M H2SO4 acid solution and least for Hank's solution. The hard coatings of transition metal nitrides produced by means of chemical and physical vapour deposition techniques are widely used to mitigate wear of cutting and die tools (Weng et al. (2008), Kelesoglu et al. (2002). In many applications, it is additionally desirable that the coating should provide the substrate with an improved corrosion resistance (Hayashi (2006). 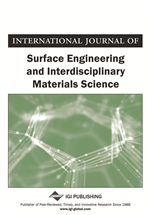 With progress in the physical vapour deposition techniques, which offer the possibility to deposit the hard coatings at relatively low processing temperatures, the coating for the structural materials subjected to wear is also becoming more and more relevant (Hayashi (2006). In such applications, the corrosion resistance obtained by the coating is of much greater importance. Hard coating materials are, in general, nobler than metal-based substrates.Therefore the corrosion resistance of a coated part is closely related to the extent the coating isolates the substrate from the corrosive medium. The transition metal nitride coatings have some excellent properties, such as high hardness, good wear resistance, chemical stability (Wang et al. (2009), corrosion resistance(Deng et al. (2008), Wiiala et al. (1998) and van Leaven et al. (1992) and attractive colors (Cheng et al. (2006) and Beck et al. (1993). Therefore, these coatings (especially TiN coatings) are widely used in industry in the current decade. More recently, ZrN started attracting more attention because of its better corrosion resistance, more bio-compatibility, higher hardness, better lubricity, more ductility and more pleasing golden color appearancethan those of TiN film(Huang et al. (2003).Mechanical properties of these two coating are almost similar.The microstructure and properties of a ZrN film varies with the deposition techniques and processing parameters (Larijani et al. (2009). Among the various deposition techniques of producing ZrN coatings, ion plating rendersthe best adhesion between the coating and substrate and produces best surface finish. As a protective coating material, ZrN is likely to be used in an oxygen atmosphere. ZrN coatinghas also been used to improve the corrosion resistance of some biomaterials such as stainless steels and NiTi alloys(Zhang et al. (2008), Hubler et al. (2001) and Chou et al. (2003). Chou et al. (2003) reported that bi-layer ZrN/Zr coating deposited on 304 stainless steel by a hollow cathode discharge ion plating (HCD-IP) system exhibited the highest corrosion resistance in comparison with single-layered Zr and ZrN coatings.More interestingly, the incorporation of a certain amount of silver (Ag) in the ZrN coating enhanced the corrosion resistance of the coating whilst also introducing antibacterial properties to the coating.Kelesoglu et al. (2002) found that the improved corrosion resistance of the magnetron sputtered ZrN coating on plain carbon steels was parallel to the morphologicalimprovement in the coatings (i.e., reduced porosity and surface defects). Low or mild energetic ion bombardment with high flux was proved to be an effective way to improve the morphology of the coating.Two kinds of oxides would be generated during oxidation, such as tetragonal and monoclinic zirconia. Molar volumes of these two oxides are different. Molar volume of tetragonal zirconia is higher than that of monoclinic zirconia.